WBAI’s Morning Show attended Samidoun’s protest in New York City on Friday, 24 June, outside the offices of G4S, the British-Danish security corporation that provides security systems, equipment, and control rooms to Israeli prisons, checkpoints, detention centers, and police training centers. Mitchel Cohen interviewed participants in the protest and representatives of Samidoun, focused on the case of Bilal Kayed, the Palestinian prisoner on hunger strike since 15 June after he was ordered to administrative detention without charge or trial rather than being released after the expiration of his 14.5 year sentence in Israeli jails. 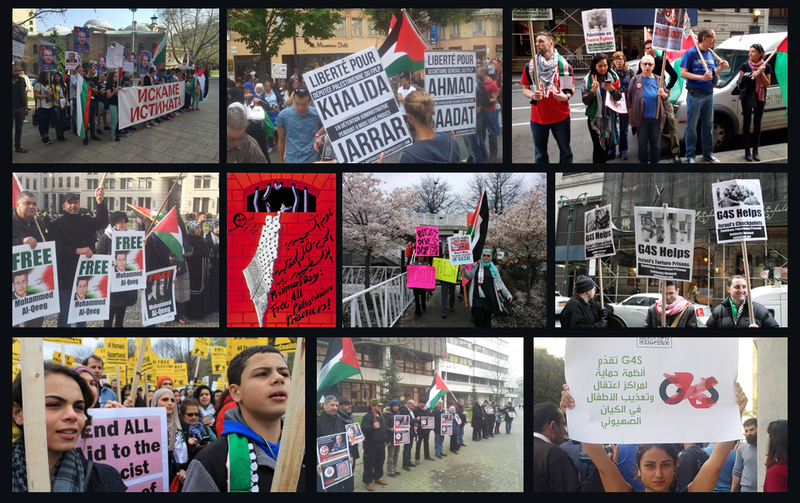 The protest in New York was part of global days of action on 24 and 25 June which saw events and actions for the freedom of Bilal Kayed take place in New York, Brussels, Amsterdam, The Hague, Torino, Milan, Berlin, Toulouse, Dublin, Belfast, Galway, London, Paris, Athens, Vancouver and other international cities. Fatima Hassan of Samidoun noted that they received a largely positive response from passers-by who interacted with the protesters. Joe Catron of Samidoun highlighted the participation of G4S in the repression of Palestinian prisoners, and the global boycott against G4S for “everything from equipping Israeli prisons to running its own private jails in various countries, to operating vans for Immigration and Customs Enforcement that deport migrants across the Mexican border.” G4S – the subject of a boycott call from Palestinian prisoners, as well as Black liberation and anti-prison movements – has pledged to sell off its interests in “reputationally damaging” businesses like its Israeli business. Palestinian organizers have emphasized the importance of continuing to target G4S so long as it remains involved in profiting from the imprisonment and oppression of Palestinians. Samidoun is organizing another protest for freedom for Bilal Kayed outside the offices of G4S, at 19 W. 44th Street in Manhattan, on Friday, 8 July at 4:00 pm. On 8-15 July, Samidoun is calling for an international week of action for Kayed’s freedom, also marking the anniversary of the assassination of Palestinian revolutionary writer and novelist Ghassan Kanafani.